It's too much trouble for me to rub the vegetables with salt and wait hours until they are ready, so I just used the microwave. I make this with a mixture of rice vinegar and apple vinegar. Try it with whatever vinegar you'd like. The vegetables cook in the microwave, so there's no need to rub them with salt first. 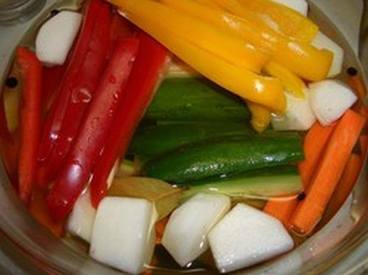 It will keep for a while if you make sure that the vegetables stay soaked in the liquid.